Ryan, curator and head of Vertebrate Paleontology at the Museum, published his findings on the new genus in the book, "New Perspectives on Horned Dinosaurs: The Royal Tyrrell Museum Ceratopsian Symposium," available from Indiana University Press. Ryan was the book's lead editor. Medusaceratops had giant brow bones more than 3 feet long over each eye, and a large, shield-like frill off the back of its skull adorned with large curling hooks. Medusaceratops lokii means "Loki's horned-faced Medusa," referring to the thickened, fossilized, snake-like hooks on the side of the frill. It was named after Loki, the Norse god of mischief, because the new dinosaur initially caused scientists some confusion. "At first we couldn't figure out what we had," said Ryan. 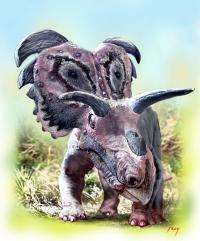 "Some of the material looked as if it came from a form related to Centrosaurus, a centrosaurine noted for having short brow horns. The rest of the pieces had giant brow horns similar to Triceratops, a chasmosaurine. That's one of the problems with bonebeds—even though you can collect a large amount of material, much of it is broken and all of it is disarticulated, so the story is rarely clear cut." "Although the ornamentation on the frill is pretty spectacular, it probably was not used for defense against predators; rather it was more likely prehistoric "bling" used to attract a mate," said co-author Anthony Russell, Ph.D., professor of biological sciences at the University of Calgary in Alberta. 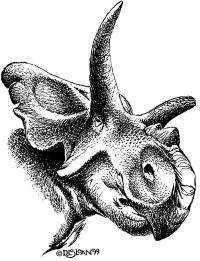 "Medusaceratops is the oldest member of the Chasmosaurinae in North America and shows that the group, like its most famous member, Triceratops, had long brow horns and were fairly large when they first evolved," said Ryan. "But later chasmosaurs that are just a bit younger than Medusaceratops tend to have much shorter horns and have much smaller, lighter bodies. "Here we have something almost the size of Triceratops, but 10 million years before it lived," Ryan said. "T. rex was not around yet, so what was Medusaceratops squaring off against? That's one of the things we're now looking for in Alberta."